Cara Nicoletti followed in her family's footsteps—but she was the first female to do so. 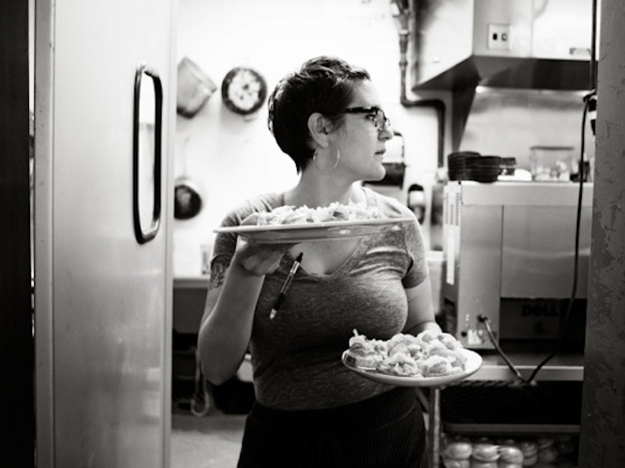 Butcher Cara Nicoletti has a confession to make: "I rarely eat meat," she tells Food & Wine. The fourth-generation butcher handles meat nearly every day—and that kind of intimacy with flesh and blood doesn't always breed cravings, Nicoletti explains. The picture of Nicoletti—who also is an accomplished baker and author of the food blog Yummy Books—may come as a surprise to some who don't encounter women in the field. And Nicoletti is happy to change their perception. To women who want to follow in her footsteps, she says, "don’t let anyone make you think that there’s only room for one woman in a shop, or that your value is based on being the only one. Support other women instead of competing with them—it feels way better." Nicoletti recently told Food & Wine how she became one of the few female butchers in the industry, and how you can follow in her meat-loving, meat-cutting footsteps. What she does: The trade goes back to Nicoletti's great, great-grandfather, she says, and while butchering skipped a generation—it was passed from her grandfather to her—Nicoletti was happy to pick up the family business. "I’m the first woman in my family to do it," Nicoletti says. While she grew up working in her grandfather's shop, she wasn't allowed to begin cutting slabs of meat until she reached her 20s. (She's in her early 30s now.) "I worked as a server, barista, line cook, and pastry cook before eventually getting into butchery—much to my grandfather’s horror," she says. She's written a cookbook, Voracious, in which she cooked and butchered her way through her favorite recipe tomes, and hosted a Facebook show with Munchies in which she cooked hangover-fighting food. 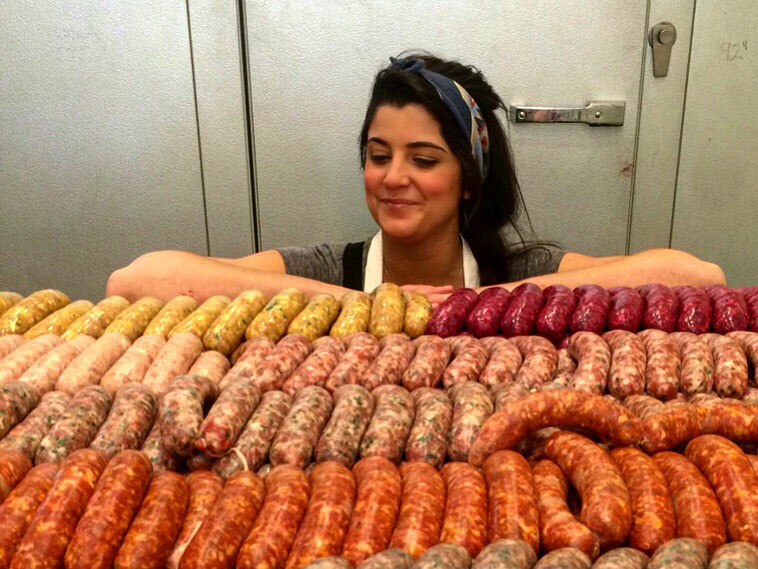 But her favorite part of being a butcher is still making sausage. "It allows me to flex my creative, recipe-development muscles," she says. And her Instagram fans—of which there are nearly 18,000—eat up her frequent sausage photos and recipes. How she does it: "Even though I grew up around butchery," Nicoletti admits, "I still had to learn everything from scratch—things have changed dramatically since my grandfather was in the trade." Years ago, as she was working as a restaurant baker, Nicoletti found herself with a lot of downtime—and she used that time to do light butchery for the owners, "breaking down chickens and pork shoulders," Nicoletti describes. "It sparked something in me and I decided I wanted to try it out for real." Her tutelage began untraditionally: "I walked around my neighborhood and asked every old man in every butcher shop I could find if I could work there for free," she says. "They all laughed at me—but one shop finally told me to come back the next day. I worked for them for over a year for free, doing all the dirty jobs—sorting hog casings and scraping bones, before they hired me on full time. I stayed five years." Two butcher shops later, Nicoletti still hasn't attended culinary school and has no regrets. "All of my experience just comes from doing—and doing and doing," she says. "Repetition and muscle memory are really the keys to getting good at cutting." Her career advice: Become a butcher for the right reasons. "Do this because you are truly and genuinely interested in it and passionate about it," she encourages. "I think there is a lot of pressure now to do something that could get you noticed and make you famous, or at least Instagram famous, but this job is incredibly difficult. It can be mind-numbingly tedious and dirty and smelly and absolutely physically exhausting. And if you aren’t in it because you really love it, you’ll just be wasting your own time." With that passion in place, you can, like Nicoletti did, take a job that will allow you to learn butchering skills. "Make sure you’re in a place where you feel there's potential for you to grow and learn, but also be ready and willing to do the jobs that no one wants to do for a while," she says. "Put your head down and work hard, make yourself the best at whatever you’re doing, even if it’s sorting hog intestines. The caveat to all that, though, is don’t let yourself be taken advantage of." Lastly, don't forget to home your other culinary skills as you butcher, Nicoletti says. "Read cookbooks and watch videos about meat—both cutting it and cooking it," she says. "Take each muscle home as you learn to break an animal and cook it and taste it. A lot of people don’t realize that if you’re dealing with customers, knowing how to cook is one of the most important parts of the job. Butchery is only a means to an end—customers will need to know how to cook the muscles you’re giving them."